Allahabad University Admission 2019: University of Allahabad also known as Allahabad University (AU) will conduct the entrance exam for LAW, MBA, BEd, BA, BSc, BCom, BSc (Bio), BFA, BPA, BSc (Maths), MCom and MA etc courses. This entrance exam will be held by the official authority of AU. 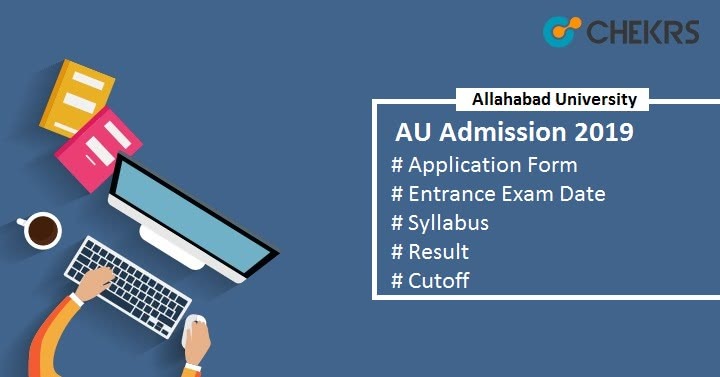 All candidates who wish to take admission in AU for the academic session 2019-20 can apply online for the Allahabad University Registration Form according to the various courses provided by the university. The admission will be done on the basis of entrance exam marks and the counselling process conducted by the university. Check here all the information related to the Allahabad University Entrance Exam 2019. Candidates must ensure the Allahabad University Entrance Exam Eligibility Criteria before applying for the course of your choice. The eligibility criteria will vary according to the courses chosen by the aspirants. UGAT 2019 Students must have passing certificate of senior secondary education from any recognized board in any streams. PGAT 2019 Aspirants must have passed graduation from any recognized university or colleges. LAT 2019 Should have degree in law programme with at least 45% aggregate from any recognized university. IPS (Institute of Professional Studies ) Must pass class 12 or equivalent exam in any stream. MBA Passed bachelor’s degree from any stream from any recognized university or institutions. All the interested and eligible candidates can fill the AU Application Form after releasing it on the official site. The application form will be issued for different courses on different dates separately. Follow the listed steps to fill the AU Registration Form. Go to the “Admission Test 2019” portal. Search for the application form link according to your course for which you want to apply. Fill the all required information and then upload the scanned images as per specified format. Pay the examination fee according to the course. Fee can be submitted through online mode via credit card/ debit card or net banking. The syllabus will be varied according to the different courses. AU Syllabus will be decided by the official authority of University of Allahabad for various courses separately. Like for UGAT degree course, the syllabus will be comprised on class 12 standard whereas candidates, who will apply for the AU PGAT 2019, must go through the syllabus of graduation level. Make a proper study plan and follow it strictly. Focus on each topics and subjects as each subject will carry equal weight-age. Practice more & more previous year paper. Take help form text-books and reference books also. Try to give mock test to enhance the speed and efficiency, and also to manage the time duration. The admit card will be available through online mode only. It will be published 1 or 2 weeks before the date of examination. Candidates, who will submit the registration form with the examination fee completely, will be able to download the AU Entrance Exam Admit Card. Check the official site of AU and then click on the link provided there to download the admit card and must carry the admit card while appearing for the examination. Allahabad University Hall Ticket is very important document as it contains all the important details like Candidate’s name, roll no, date of examination, applied course, exam timing etc. Go to the official portal of Allahabad University. Select the course for which you will apply. Login into the candidate’s account by entering the “Login ID” & “Password”. Click on the tab “Download AU UGAT/ PGAT/ LAT Result 2019”. Take the print of it for future use. After the results declaration, the university will also announce AU Cutoffs for the qualified candidates. To qualify the AU entrance exam, students will have to score the minimum required marks in the exam. Candidates who will score above the cutoff or equal to cutoffs mark, their name will be included in the AU Merit List 2019. Candidates, whose name will be in the merit list released by the university, they can take part in the AU Admission Procedure. On the basis of candidate’s performance in the entrance exam and merit list, students will be invited for the AU Counselling Process. The counselling process will be organized through offline mode. Applicants will have to report at the counselling venues with the relevant documents for the documents verification. In case, candidate will be absent ,then he/she will not be considered for admission and their seat will be allotted to other candidate.